Home » Nutrition » Sports Nutrition » Should You Eat Before Or After A Workout? If you care about your workouts and getting the most out of them, then you have probably considered and wondered what the right course of action is when it comes to fuelling your body before and after a workout. Without good nutritional habits and timing you can find that your workouts aren't going to be as good as you like and it can even hinder your progress. Proper nutrition can be key to getting the most out of your workouts and recovering well so you can do the next workout and breaking through workout goals. One of the most common questions asked when it comes to nutrition is whether one should eat before or after your workout. Here's all you need to know about eating before or after your workout. Fasted or Fed for Fat Loss? Should you be fasted before a workout or fed to lose fat? Studies show that your body will have a different response to exercise based on whether or not you have eaten beforehand. Your body utilizes both carbohydrates and fats as fuel. Carbohydrates are stored in your muscles and liver as glycogen while fat is stored as triglycerides in fat tissue. Carbs are also available as blood sugar. If you are carb depleted and your glycogen stores are empty, then your body will utilize fat as a fuel. When you exercise on an empty stomach your body's energy requirements will by more likely met by the breakdown of fat. One study backs this up with its findings. It found fat burning was higher during fasted exercise while glucose and insulin levels were higher during exercise where food was eaten beforehand (​1). Given that your body burns more fat while fasted, it would be easy to assume that this would mean that you would have greater fat loss over time and thus should always exercise fasted. However this may not be the case. Some studies have shown there to be no difference in fat loss between women who exercise fasted compared to those who ate beforehand (​2, ​3). So although it may make more sense to stay fasted for fat loss, it isn't actually the case particularly over the long term. So if your goal is to lose weight, it may make no difference to eat or not eat before you exercise. Maybe the type of workout you do instead is the key factor. One of the biggest concerns of whether to eat before exercise is whether it will harm performance. There has been some research that has looked into this and the majority shows no difference in performance between those who ate before and those who didn't when it came to aerobic exercise. In these particular studies the exercise in question lasted less than an hour. (​4, ​5). Research has also looked at whether high intensity interval training requires a meal beforehand too. They also found no difference between fed and fasted invidiuals when it came to this type of exercise (​6, ​7). The exercise in these studies was short duration exercise and thus the likelihood is the body had enough stored energy to cope with the demand. Stored energy allows you to exercise even if you haven't eaten in hours. However some studies have shown that there is an improvement in exercise performance when high carb meals were consumed before exercise compared to fasted (​8, ​9). So therefore it looks like for some people eating before a short workout will be beneficial in exercise performance. As a runner I have done both. A few years ago I never ate before I ran. If it was a morning run or morning workout, I would do it on an empty stomach. This seemed to work at the time. My main concern back then was that I had problems with food not digesting properly or interfering with my running, so would opt to not eat to rule it out. These days, I eat before I run unless it's a really early morning easy run. If I have intervals or a hard workout I always eat something prior to it. It is what works for me right now. I couldn't' say there was much difference in how I performed. Before I wouldn't even eat before a morning race whereas now I feel I need to and feel it helps my performance, however in the past I wouldn't say it hindered my performance then. Things change; we change. The fact that there is science to say that it doesn't help and science to say it does help should help you focus on what feels right for you. Experiment and see what works. Pre workout fuelling may not be necessary for every workout you plan. Of course we are talking about short duration exercise here, so what about long duration exercise? A meta-analysis of the effects of fasted versus fed state exercise found that 54% of studies that were analyzed, showed that participants performed better in exercise lasting over an hour when they consumed food before hand (​10). The studies which showed a benefit to a pre workout meal were those where the meal was primarily made up of carbohydrates. Studies have also shown the benefit of eating carbs as little as an hour before long duration exercise (​11) as well as 3-4 hours before long duration exercise too (​12). So based on the evidence it would be wise to eat before you embark on a work out that lasts more than an hour. As a runner I have done both - not eaten and eaten. I generally have a small snack if it's a morning long run which sees me through. Some times when I haven't I will bonk and definitely feel the last few miles dragging out under the weight of my lack of energy. I have also found that by eating beforehand I recover much better than when I don't eat beforehand (but we will get to this later in the article as they is some research which backs up this). So pre workout nutrition appears to be essential for me. Although exercise performance may decline without food beforehand, there are other reasons why its beneficial to do long duration exercise fasted. A study conducted in New Zealand showed that cyclists who completed exercise early in the morning without eating beforehand improved muscle glycogen stores by as much as 50% over the group that ate breakfast. Other studies have also suggested occasional fasting can have benefits in improving glycogen stores (​13). This is why marathon runners tend to have a good few days of carbohydrate depletion and fasted state running before bulking up on carbohydrates before the big race. It also suggests the occasional workout without food beforehand is beneficial for improving your glycogen stores. As research shows that no food can result in a decline in exercise performance it is wise to focus on the word OCCASIONALLY when it comes to fasted state long duration exercuse. If you do end up doing a workout fasted, make sure you eat afterwards. Eating afterwards can help your body recover from the exercise you have done. If you didn't eat before your workout then you would have fuelled that workout using your body's own energy stores. They will be depleted and need replenishing. You will have limited nutrients to aid recovery. If you did eat then it is likely that there will still be nutrients in your blood to help aid recovery (​14). The meal you eat should be a mixture of protein and carbs as they are both beneficial for recovery. One study found that eating a meal containing protein and carbs after fasted exercise led to greater increases in the production of proteins in the body compared to no nutrients consume (​15). I know from personal experience that I feel better after eating a snack/meal of carbs AND protein after a workout than just carbs. A recent study showed eating before exercise increased the rate in which the body burned carbs during exercise but also showed that these effects continued after exercise. They also found that the carbs being burned were not only from the breakfast eaten but also from carbs stored in the muscles. 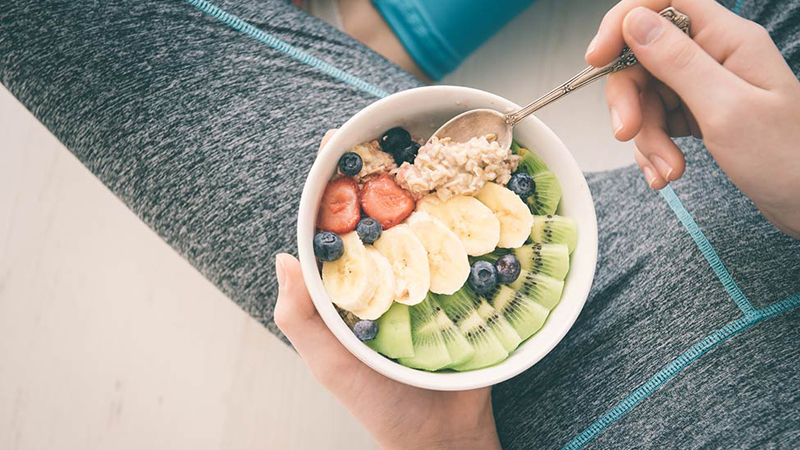 This suggests that consuming a breakfast before a workout of an hour long can help you get your body ready to absorb nutrients afterwards and recovery well. So eating something before your workout not only helps you have the energy to complete it but it also helps your body rapidly absorb nutrients afterwards from your post workout meal, for better recovery. So if we are to go by this study, it would seem that eating before AND after is the best thing you can do. (You can read more about this study here). I definitely feel that my reflects this study. I feel and recovery much more easily when I eat before and after, even if my before food is just a snack before heading out. When I don't eat beforehand I can't seem to eat enough afterwards to compensate for how depleted I feel and can feel depleted for the rest of the day despite my post workout fuelling. How Soon After Exercise Should You Eat? Again, this question has a mix bag when it comes to research. Some studies suggest that there are no differences in recovery over the 8-24 hours post exercise when comparing eating immediately after exercise and eating 2 hours after ​(16). While other studies have shown that it is important to consume protein immediately after exercise and that it is beneficial to muscle growth (​17). As research is mixed, this is another case of experimentation. It seems sensible though to aim to eat something as soon as you can after exercise. If you need to drive home from the gym before you can eat a meal, you could opt to back a protein bar or snack so that at least you are consuming something straight after your workout. You then are giving your body a bit of fuel straight away so it can wait for the main meal when you get home. I think it is important to eat something immediately after exercise. So if you can pack a snack in your gym bag and eat it immediately after that is probably the best option. You can then get home and have a proper meal. This is certainly going to be more important if you haven't eaten beforehand too. Your body will thank you for it. The research is quite a mixed bag, but the recent study showing that both pre and post workout nutrition is important probably sways it for me to continue what I am doing which is exactly that - eating before and after. However the best way to really tell what works is to do your own experimentation. Sometimes mentally, eating beforehand can help. None of these studies really talk about the mental game. This is why pre workout supplements are so popular because a lot offer that mental energy that can be lacking when you get up early to squeeze in a workout or when you're knackered at the end of the day and need a little pick me up to get through your workout. If you feel fatigued before your workout then eat something to pick yourself up. Equally if your stomach doesn't like food in it before a workout and it could derail your session, then don't eat it. If you have very little time before a workout to eat then accept you can't eat or opt for a sports drink or pre workout supplement for that little boost you need. Experiment and you will soon find out what doesn't work and what does work for you. That's really what matters here not what a study thinks you should do because ultimately we are all individual. The mixed results from different studies proves that. Whether you should eat before your workout or after or both is something many of us struggle to work out. Although fasted exercise may result in the body burning fat this doesn't necessarily translate into more fat loss. Equally fasted exercise doesn't necessarily have a negative effect on exercise performance as long as its duration is less than an hour. However if you intend to do longer workouts than an hour, then eating beforehand is going to benefit you the most. Eating beforehand can also help you absorb nutrients from your post workout meal. So although fasted exercise may not decrease your performance, you may not absorb the nutrients from your post workout meal as well as you would if you had eaten before and therefore recovery will be impaired. Overall, personal preference should be the main factor in your decision to eat before a workout as the research suggests that it doesn't really matter what you choose in that respect. However whether you decide to train fasted or fuelled you should always eat a post workout meal so you can replenish and recovery from the workout you have done.